Montana Calligraphy Cap 10-PackThe Calligraphy Cap is has an average spray width from 0.5“ to 3“ which results in a calligraphy line. Suitable for for handstyles and creative outlines. The spray width changes with the used distance to the object. For skinnier lines, spray from a closer distance. For fatter lines, spray from a further distance. 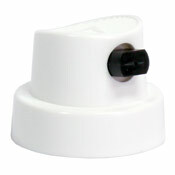 The Calligraphy Cap is has an average spray width from 0.5“ to 3“ which results in a calligraphy line. Suitable for for handstyles and creative outlines. The spray width changes with the used distance to the object. For skinnier lines, spray from a closer distance. For fatter lines, spray from a further distance. This product was added to our catalog on Friday April 12, 2019.